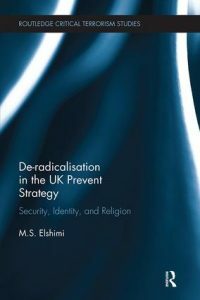 This book examines de-radicalisation policy in the UK and addresses the contradictions evident in the conceptualisation and practice of de-radicalisation. It explores three main themes that touch upon some of the most pressing issues of our day: security, identity and religion. Situated within the Prevent strand of the UK Counter-Terrorism policy and administered by the police through the ‘Channel Programme’, policymakers have promoted de-radicalisation as a vital instrument in the fight against terrorism. Despite the political and legal importance of de-radicalisation as an instrument of counter-terrorism, we continue to know very little about the programme and the profile of individuals who have been de-radicalised, as well as having little or no access to data on the programme. There is also a glaring lacuna in the wider literature regarding the concept, theory, and evidence base for de-radicalisation policies. This book addresses this lacuna and, with the use of data collected from interviews conducted with 27 practitioners, this work reveals the existence of multiple conceptions of de-radicalisation and a number of conceptual features unique to the UK context. Subsequently, the book proposes that de-radicalisation in the UK would be best conceptualised as ‘technologies of the self’. Seen in this way, de-radicalisation is less about tackling terrorism and radicalisation and more about the re-configuring of citizenship, the construction of a mainstream British identity, and the promotion of certain subjectivities in an era of uncertainty about British political identity. This book will be of much interest to students of critical terrorism studies, de-radicalisation, counter-terrorism, UK politics and security studies in general.